Biskhek is the largest city and the capital of Kyrgyzstan in Central Asia. It lies in the very northern part of Kyrgyzstan, near Almaty in neighboring Kazakhstan. Bishkek is connected to other Central Asian destinations like Taraz and Shymkent by the Turkestan-Siberia Railway, and it sits against the scenic Tien Shan mountains, which beautifully frame the city. Like other Central Asian cities such as Turkestan, Bishkek was originally a caravan rest stop along part of the Silk Road from China to Europe. Today, Bishkek is an intriguing mix of classic Soviet style and contemporary Asian and European influences. With its lovely dry climate, Bishkek is a wonderful city to enjoy in the sun, and Oak Park is a popular spot where locals rest and enjoy the cool shade. After relaxing in a park, it is always easy to find your way in the organized city streets or to use Bishkek's public transportation for a tour. The central part of Bishkek is laid out in a grid pattern, with the main north to south street being Yusup Abdrakhmanov Street. Here you will find multiple major shopping areas as well as Bishkek's mile-long Dordoy Bazaar. The Dordoy Bazaar has been called one of the greatest public market places in all of Asia, on the same scale as the Grand Bazaar in Tehran or the Chatuchak market in Bangkok. Many goods come from China to the Dordoy Bazaar and then find their way into shops in Kyrgyzstan, Kazakhstan, Russia, and Uzbekistan. 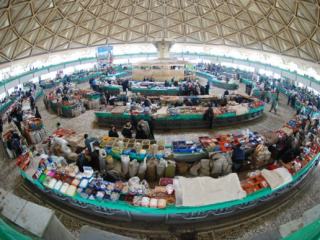 Delectable food shopping can be found in the western part of Bishkek at the Osh Bazaar. BishkekBishkek also offers travelers many cultural sites and activities. 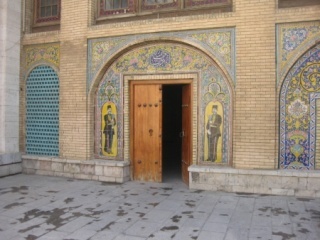 The city's center is Ala-Too Square, where many important buildings are found. The National Historical Museum is located on the square, and the gleaming marble White House, the government seat, is also located here. One can also watch the changing of the guards at the Independence Memorial in Ala-Too Square. Other interesting sites of Bishkek include the National Museum of Applied Arts, with beautiful examples of native arts and crafts from Kyrgyzstan, the Frunze House Museum, and the Manas architectural complex. Bishkek also boasts many statues and monuments, such as those to Ivan Panfilov, a World War II hero, the People's Friendship monument, and one of the only remaining monuments to Lenin in Central Asia. Bishkek evening entertainment includes a number of theatres, including Russian and Kyrgyz dramas, ballet, and opera as well as the national Philharmonic. After sampling the variety of fascinating activities in the city, travelers enjoy taking a short ride to the scenic Ala Archa National Park, which offers hiking, animal watching, and mountain climbing in its beautiful gorges, glaciers, waterfalls, and mountains.